Today was busy at the refuge. Very busy, even. But the end result, despite all the comings and goings, was just one extra dog on the books. And even he might leave as he is identified in the name of the breeder, who will give us the new owner’s name tomorrow. Fingers crossed that the dog’s owner comes to collect him. The other four (yes FOUR) arrivals were all identified so all left straight away. 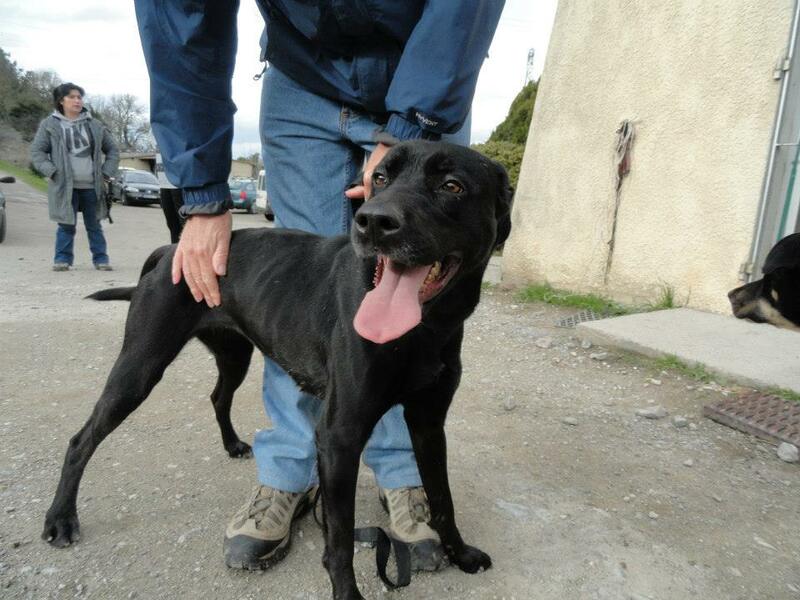 However all of this takes time; booking dogs in, searching on the central database, and contacting the owners. My heart sank when I heard about the number of dogs in, and my immediate thought was “but we have just homed five dogs to the UK, will this never end”. And of course it will never end. But at least today was not just a question of filling up the spaces we have just made! That will happen in due course I am sure. So what do we do when we have nothing to talk about? We show you photos of happy dogs, of course! First up is Benson, who was homed just over a year ago to volunteers Rebecca and James (he of the recent dog- delivery fame). Look how handsome he is, and none the worse for his ordeal of having been left starving on a balcony! Next up we have Harlequin, homed in the UK thanks to a border collie rescue organisation and who is now an agility champion. Then we have recently adopted Luxor (now Luther), who is seen here together with Gwen. They, are both in the UK with our great friends Anita and Phil. Closer to home we have Sherman, adopted and adored, despite his age. Older dogs can be the best companions; they have the maturity to appreciate the second chance that life has given them. Thanks so much to Elodie for sending us photos so regularly. It really keeps us going on the bad days. 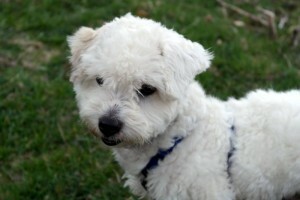 Finally we have recently adopted Oscar, now Gryphon, who is turning out to be the perfect pet. 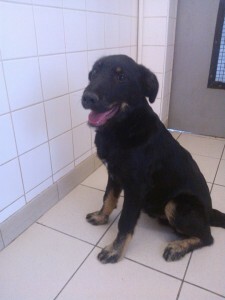 Happy news today, despite there having been no adoptions! Sherman. I think he knows he is loved, don’t you? 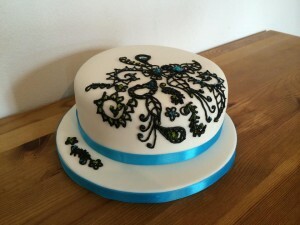 And Anna’s cake. Guess the weight! After all the excitement of yesterday, I thought I would let you know what else has been going on at the refuge. The owners were not happy when they came to collect her, as in their opinion we should have contacted them. We pointed out that the details on the database that corresponded to the tattoo were out of date, but they were upset that we had not called the phone number that was “clearly marked on her collar”. Except it wasn’t. There was nothing on her collar at all. It is very important to keep your details up to date at the central database. Otherwise it takes a bit longer for us to contact you, assuming we are able to track you down that is! It is a good idea to put an engraved medal on your dog’s collar with your phone number on it, rather than just using a marker pen as in this case. Or if you do use marker pen, make sure it is indelible! 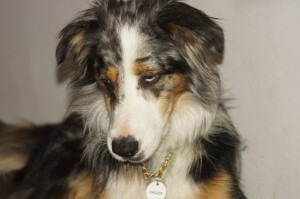 This is also the case if you know that your dog’s tattoo is a bit hard to read, due to age. Today we had three new arrivals. One of them was identified and hence was collected immediately, but the other two are not identified and so are still with us. First a tiny wee girl who was found at the gate; she is about the size of a papillon and hopefully someone is looking for her. She is not in the first flush of youth. Second was another little girl, this one found in the local village or Cuxac Cabardes. Information on both will be available soon, after they have been to see the vet. I am sure that like me many of you were wondering how James got on with the dogs who left yesterday. Moira and James have been in touch, and all is going well. So once again thanks to everyone for this heroic effort, especially Moira and James. 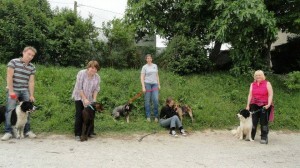 And yes, of course we will pass on news of the dogs as each of them is homed. Five More Leave For The UK! Last week Darcey mentioned in her blog that I was on my way back to France and that I was visiting rescue organisations enroute. I have to say that I loved every minute of these visits and was very, very impressed with both the welcome I received and the rescues themselves. Rescues can be very stressful places for the animals that find themselves there, for the staff, the volunteers and indeed for visitors. A bit like buying a house, your initial impressions go a long way but when you are met with a smile and a ‘how nice to meet you’ it helps a lot! When we enter into negotiations with other rescues its initially by email or by phone but the UK rescue world is very small and as well as doing our own research we ask others for their opinions and recommendations. 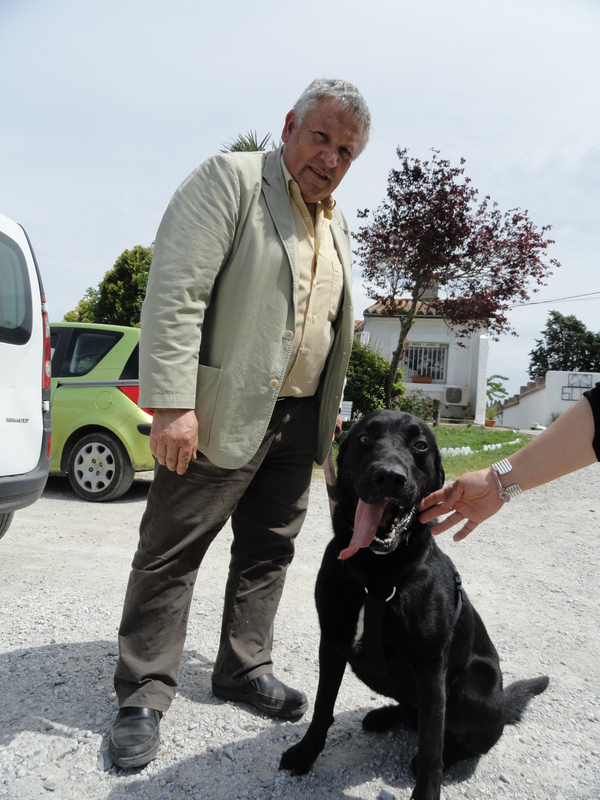 This means that we know that the associations have similar policies to ours and that our dogs are in very safe hands. Saying that, nothing is better than meeting the staff first hand and seeing the facilities for yourself and thus the purpose of my visits. So..who are the lucky five dogs who have left? Ako, Babette, Bond, Heart and Woody! 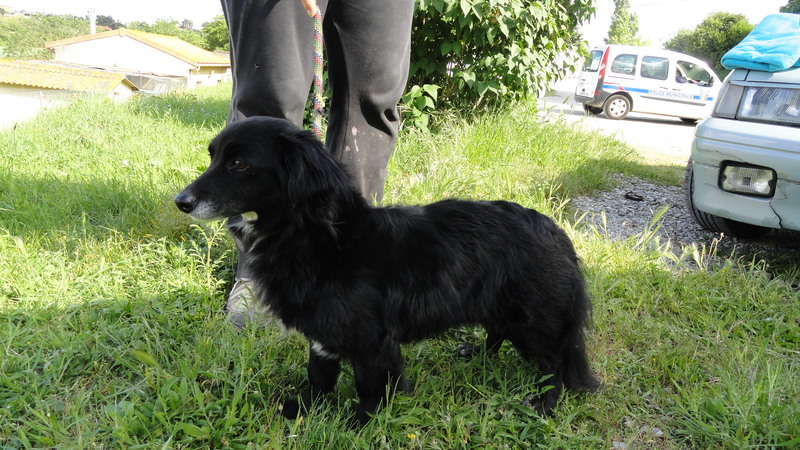 Heart and Ako are border collies and are young, active, very clever dogs who need much more mental and physical stimulation than we can possibly give them. They are off to a specialist border collie association where they will be assessed, trained and placed with a loving family. Bond and Babette are probably ex hunters who have been rejected, most likely as they were not good hunters. This is no suprise as they are both really loving, affectionate and will make superb family pets. They are going together to a rescue who is very used to both ex-breeding and ex-hunters and who have a fantastic network of foster homes. They will initially go into the rescue to be assessed and we are confident that they will be in the perfect family very quickly! 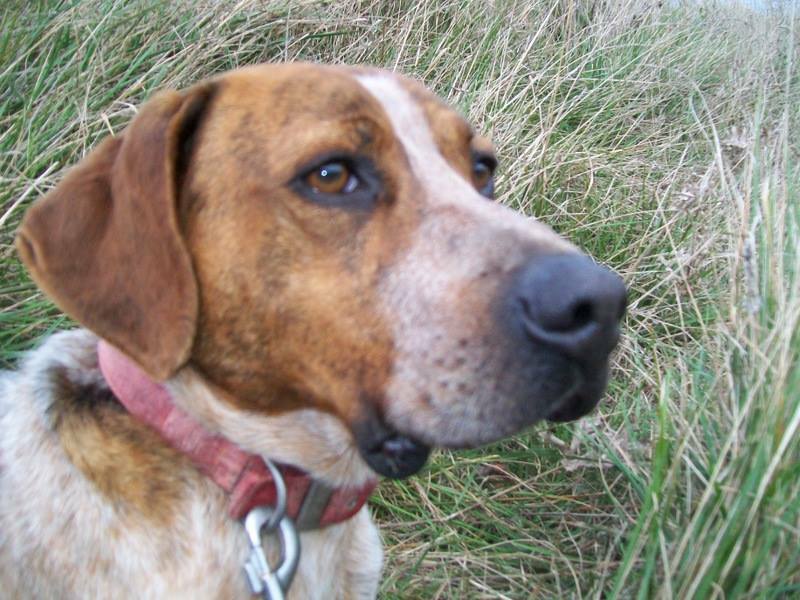 Woody is a pointer cross who was eventually caught and brought into the SPA after Carole saw him wandering in the village where she lived. 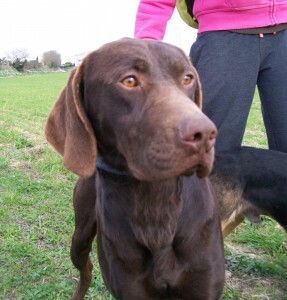 He was extremely scared and thin when he arrived but flourished quickly and now he has the chance to go to an association, specialising in pointers who can help him along the way to his forever home. So today the paperwork was checked, extra feeds given, dogs were walked, bowls, food, towels, blankets etc were packed and all five left with our superb volunteer James, who is driving them to the UK towards their new life. It takes a very special person to offer do do this, so a massive thank you to James and to his partner Rebecca, we know that they are in very safe hands and we wish everyone a very safe journey! Yesterday’s blog got many reactions, as you can imagine, mostly from people just expressing their approval on Facebook, with a “like”. 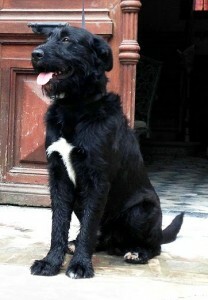 My favourite comment came from our stalwart supporter, Michele, adopter of scruffy mutt, Pitchou. She wrote to say that yesterday’s adoptions were the work of Chaussette, who was looking down on us in our sadness and wanted to show us that we should never ever give up the fight. 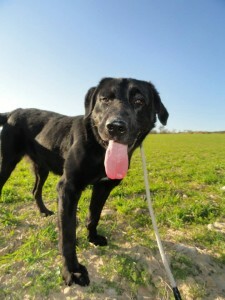 Other people asked about the whole black dog syndrome. 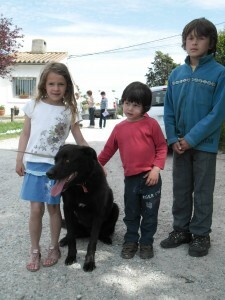 We have many black dogs in the refuge, overlooked because of their colour. And tonight’s blog is dedicated to them. It may seem strange to many people who have black dogs (like both Moira and I), but there really is a prejudice against dogs of this colour. It used to be considered that they brought bad luck, “son and daughter of the devil” etc. But even though most people know rationally that this is nonsense, black dogs remain hard to home. Is it because there is nothing to distinguish them from the pack? In fact I find nothing more wonderful to look at than the coat of a glossy black labrador. The refuge is perhaps not the best place for this, as dogs can look scruffy, lacking the regular brushing and exercise of family pets, but give them a week or so in a home environment, and they will look just amazing. Here is a lovely poem written by a lady called Ginny Hewitt, who obviously is a big fan of the black dog. This poem can be found on the website of a British association called Many Tears, and Moira will tell you more about them tomorrow, when we will have some very exciting news to share. When anyone who’s owned a dog knows beauty lies within. Balthazar. At the SPA since April 2013. 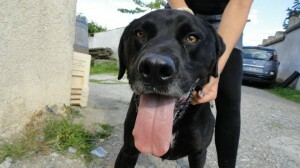 He, too was identified when he arrived, but his owners never came for him. Bathazar is 7 years old. Chips. At the SPA since August 2012 having been found straying. Chips is 5 years old. He was just over three when he arrived. Occitane. This lovely fine-boned black lab cross has been at the SPA since August 2013; she is just 3 years old. They are not the only black dogs we have. Remember, Black is Beautiful! Bumper day for Black dogs! With everyone still reeling from the shock of Chaussette’s death yesterday, today would have to be pretty good to raise anything even approaching a smile from most of us. Fortunately it was, and far better than we could have ever expected! We had not one, not two, not three, but , FOUR adoptions. And three of them were of black dogs. ! First to leave was little Hamtaro, but we knew he wouldn’t be with us for long. The second adoption was a fabulous surprise, though. After 2 years, we finally said goodbye to Gun. This dog was adopted from us as a tiny puppy (anyone remember the Pirates of the Caribbean litter?). 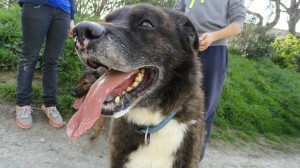 Gun was the first to be adopted, but he was abandoned when he was a year old. Woops, his owners forgot to train him! Since this time Gun has been at the SPA, that is two thirds of his short life. He has received regular walks, most notably from Benedicte, who perhaps knows him better than anyone. 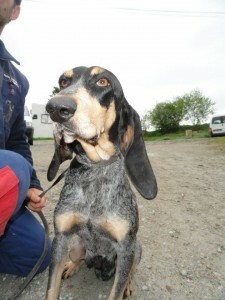 Outside of the refuge he is calm and obedient, affectionate and attentive. Quite unlike the huge dog who jumps around his box frantically. 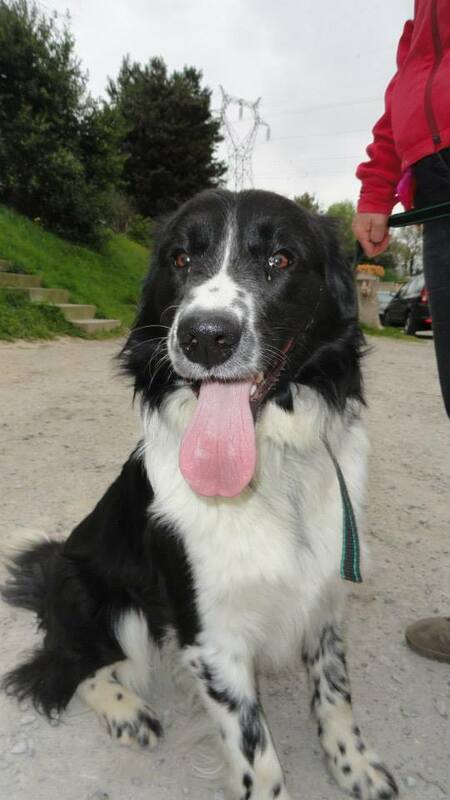 His new owner, used to know Gun when he had a home and when he was left to wander alone. In fact they used to feed him from time to time. When they came to the SPA they didn’t even know he was with us. However when dog and man saw each other, there was instant recognition. What a lucky lucky dog! Next to leave was Oscar. 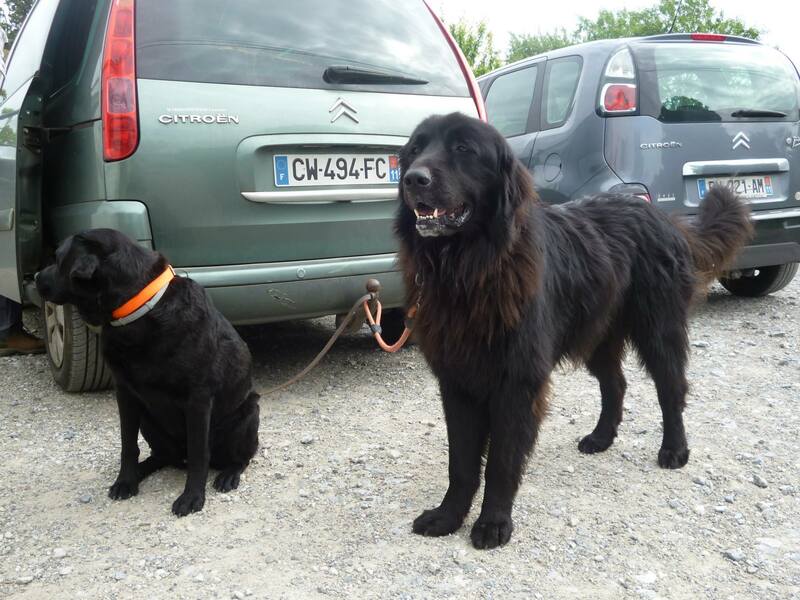 The couple had seen him on this website and were looking for a medium to large young dog to share their mountain home with them. 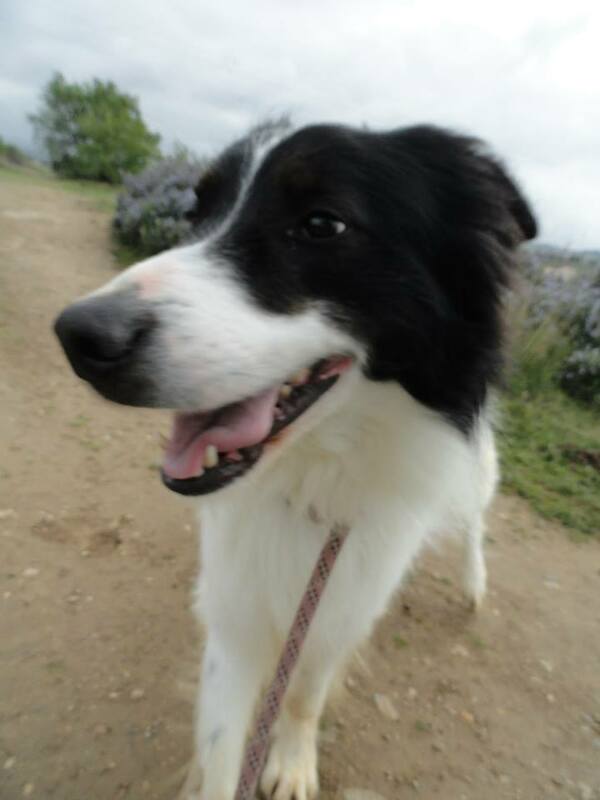 Lucky Oscar caught their eye, and he is now living with plenty of land and long walks. He had only been at the refuge for a couple of weeks, so he is one of the lucky ones, despite being black! The next departure of this amazing day was that of Toby, abandoned at the refuge 15 months ago and sponsored by volunteer Val, who luckily was there to say goodbye to him today. He has a new family and children to play with. His life is about to take a whole new turn. 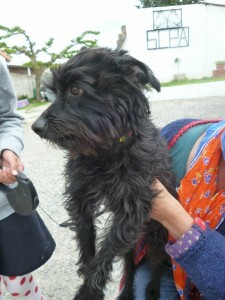 In the middle of all this, yesterday’s little yorkie was reclaimed by his owners and a non-identified black labrador arrived and left identified, as his owners were looking for him. 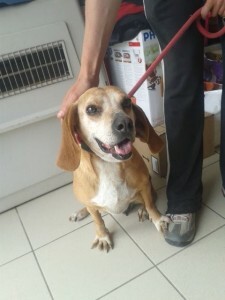 And although I don’t usually talk about reservations (being unwilling to tempt fate), Candy has found a new family already; this time one with no other dogs! It takes some time to get all the paperwork together, but at least Candy’s time with us looks like it will soon be over. When I hinted yesterday about good news on the horizon, I did not expect this!!! However the injustice of Chaussette’s final six months is plain to see. Chaussette arrived identified, just like his “sister”, Elsa. They had both been at the refuge several times before, as their owner has an “unstable life”, but each time up to now he had reclaimed his dogs once his life had got back on track. This time, however, he did not come. So instead of dying free and with his owner of over 10 years, Chaussette spent his last six months in a concrete kennel, where his health gradually deteriorated. This is the reality of abandoning your aged dog at a refuge. 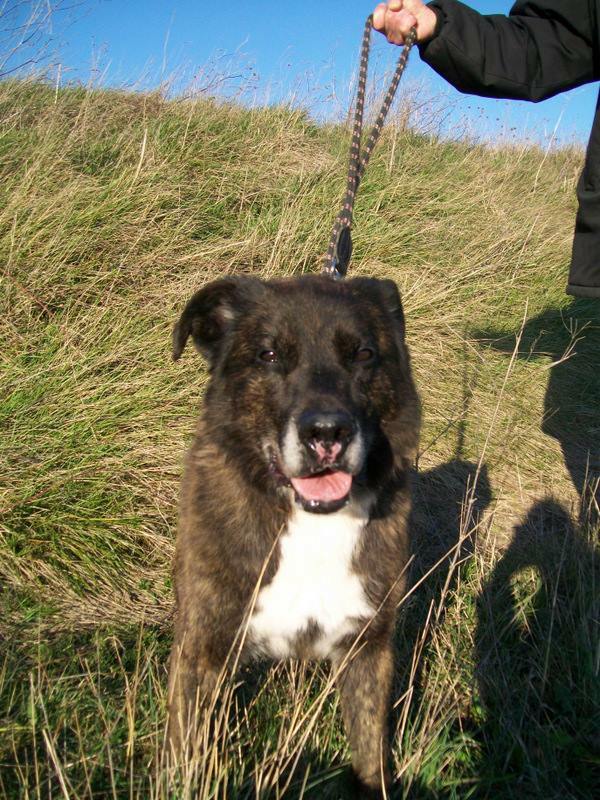 Do not assume that someone will take pity on him and take him home for a final few days, weeks or months of luxury. People prepared to do so are saints, but we all know that saints are thin on the ground. Spare a thought for all our other oldies, and think twice before abandoning your dog (or indeed cat), whatever his or her age. Do not leave others to do your dirty work for you. We do not enjoy it either. I am fed up with shedding tears on other people’s behalf and I know all the SPA employees and my fellow volunteers feel the same. Because yes, we cry, Every time. Be responsible for your own actions and your own decisions. Further bad news. I wrote a couple of days about the joy of having two rottweilers reclaimed by their owner. Dogs of this breed are hard to home, as they need permits, tests and additional insurance. Sadly few people are willing to jump through all the necessary hoops. 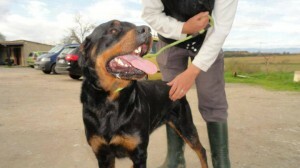 So it is a tragedy when a Rottweiler is returned to the refuge after the miracle of having been adopted. In July 2013 we were jubilant at the adoption of Candy, who had been with us for seven long months before being chosen. Better still she was adopted by people whom we knew, wonderful owners who had already adopted a dogue argentin, Fabio, from the refuge. Today they finally threw in the towel. We do not blame them. A bit like with Prosper, Candy had the perfect home. As with Prosper, compatibility had been checked (I remember the joy of watching the two dogs playing in the park), and initially all went well. But as with Prosper, jealousy of the existing dog was just too strong, and Candy, not realising that life could be a lot worse, has burnt her bridges. As with every failed adoption we learn something. We know that Candy needs to be an only dog in the family. However on the plus side we know that she is excellent with children, including very young ones (the family have two toddlers). Let’s hope this is not her last chance. Candy was born in January 2011, so let’s hope she finds a new home too. Silly girl, Candy! A sliver of good news: an injured dog who was operated on this morning following a car accident has been reunited with her owner at the vets, but to balance that, we took charge of a fabulous miniature yorkie, who is identified, but whose phone number is no longer in service. Not the best of days. I feel emotionally drained and feel a sense of desperation for the enormity of the fight that we are up against. However there may just be some good news on the horizon……. Candy is back. You blew it, girl! Old friends and a very poorly old man. Another bank holiday in France, so the refuge was shut. After some more heroic planting yesterday by Mme Aalders, we have run out of plants and places to put them (although once we have done some more tidying up we will be looking for more). And the volunteers did yet more painting, too, a big thanks to them. So today we all took the day off and spent time with our own families, both human and animal. Tonight might be a good time to catch up with some old friends. I was not at the refuge yesterday, so I missed the visit of Dingo, adopted a couple of months ago. You may recall that he had been abandoned outside his apartment building when his owners moved, and this tiny chap was left to fend for himself. He arrived at the SPA in a very tatty state and very fearful. But just look at him now; Lovely. 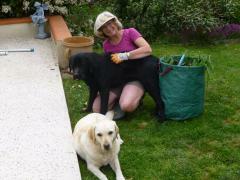 Also at the SPA yesterday we had Okkie (formerly Grizzli), who helped his owner with the gardening! Isn’t he a fabulous chap? 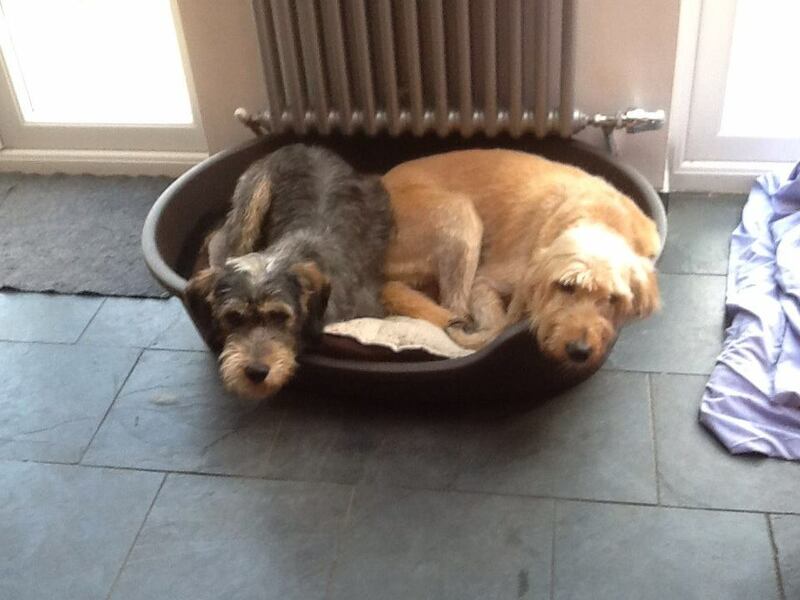 We also have news of Chipper (aka Samson), who has adapted very well to his new home, by the looks of things! And we also have news from further afield. 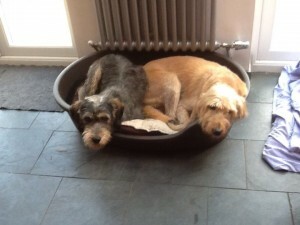 Do you remember Mango, who was homed thanks to Doglinks when he was just a puppy? Well just look at him now! What a magnificent dog and what a happy looking family. Oh, if only all dogs could be this lucky. Sadly we have over 100 who are still waiting patiently for their turn. 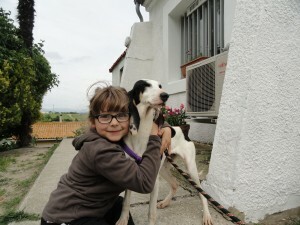 Moira is slowly making her way back to France, by the way, but making several stops en route. 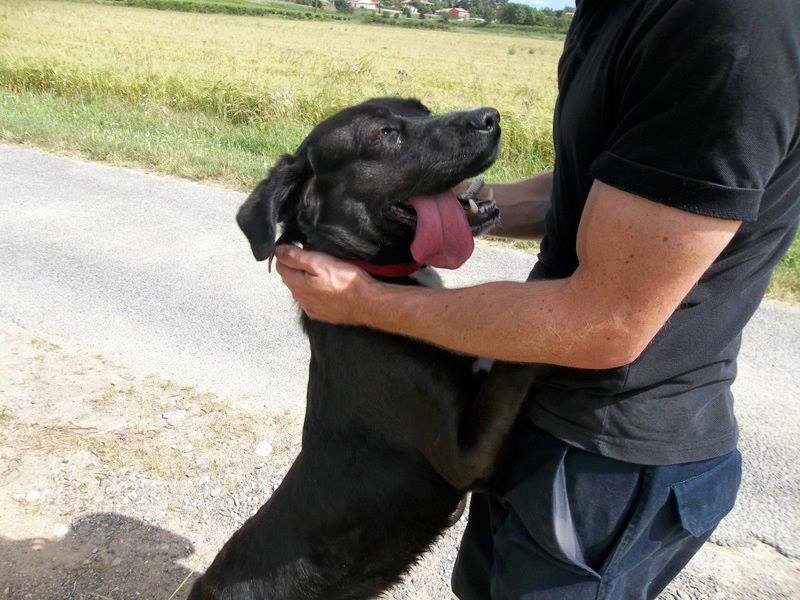 Today she is visiting an association that has offered a lifeline to some of our dogs, and providing everything goes as expected (and we have no reasons to suspect otherwise, as we do a great deal of “due diligence” beforehand), there will be more exciting news soon! Finally please can everyone send positive thoughts in the direction of Chaussette, who is very ill indeed and is at the emergency vets. He seems to have kidney failure, and we are not sure what the future holds for him. At nearly 11 years old, Chaussette is probably going to end his days at the refuge, even if he pulls through his current crisis. 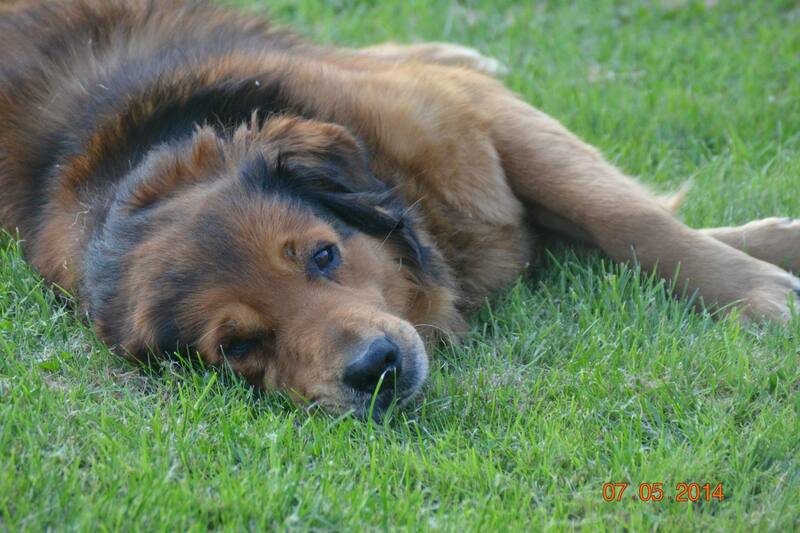 He has been with us for six months now, and this is no way for a dog to end his life. A quiet afternoon at the refuge, but that does not mean there is no news. We always dread the arrival of so called “dangerous dogs”, and this will be the subject of a future blog. Briefly, though, the owners of any dogs who are either pure bred or crossed rottweilers or staffs have to jump through a series of hoops to demonstrate their suitability as owners. As I said, the reasons for this are complex and now is not the time, just let me say that the law is inflexible and it is invariably the dogs that suffer, even when they are the gentlest dogs on earth. Today when two rottweilers arrived we feared the worst. We have five rottweilers at the refuge and homing them is very difficult (hence the celebrations a couple of weeks ago when lovely Dastin was adopted). Wwe certainly didn’t want two more to swell the ranks. However we were in luck. Not only were the dogs identified, they were also “legal”, ie there owner had all the required permits. So they left immediately! However, into each life a little rain must fall and today yet another puppy arrived. This chap is not as young as some of the puppies we get, he is about 4-5 months and looks to be a griffon beauceron cross. He is understandably a bit nervous about finding himself at the refuge, but has realised that we mean him no harm and is starting to play already. The family who brought him in “found” him a week ago and wanted to keep him, but they have a young child and the puppy was too much for them to cope with as well. Let’s hope his original owner is looking for him, assuming he was ever lost that is. Some more news in the form of an upcoming event. 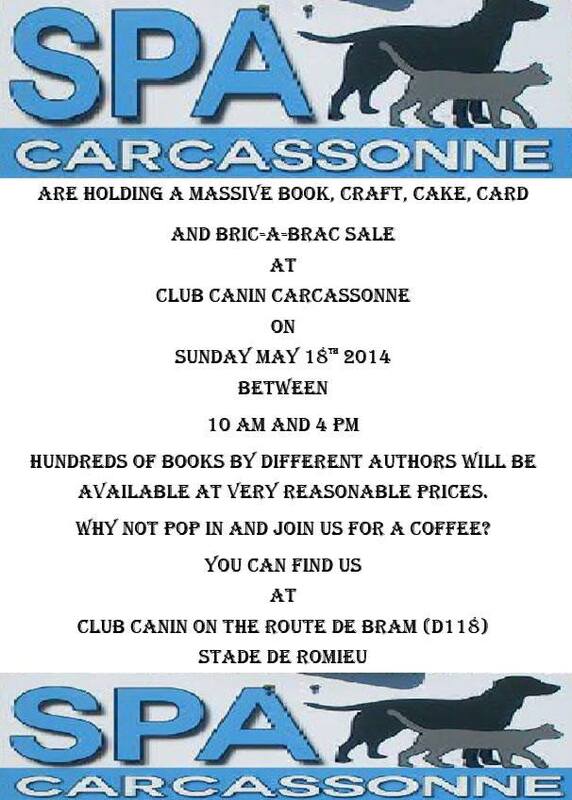 On May 18th the SPA is holding a Book Fayre at the Club Canin. 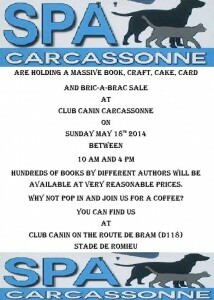 At least it was going to be a book fayre, but it seems to have developed into something much bigger! Put this date in your diaries, everyone, and please let all your friends know. If you can put up a poster in your town hall or local shop it would be much appreciated. Please support us in any way you can. The cat, the dog and the dragonfly! Now here is something that doesn’t happen very often! Just over a week ago we had a visit from Miranda, a British girl who adopted Fleur from us over two years ago, since which time the two have become inseparable. She and her partner thought it was now time to add a cat to the family group. We were short of volunteers that day, but Miranda used to dog walk with us and knows the refuge well, so I just told her to go and look round the cat house and see who stole her heart. 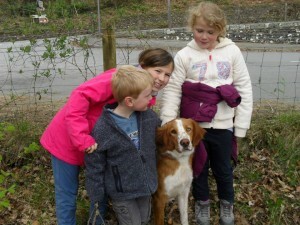 She and Damion reappeared about an hour later with big smiles on their faces, so I guessed they had found a new friend. Sure enough, I was right. Except they had fallen in love with a dog, not a cat! We took Energiser to the park where he did all his tricks. Look, I can be affectionate; look, I can be lively; look, I can be calm. Basically he did everything possible to sell himself and it worked! A reservation was made and today was the day. He was given the name Energiser as he is extremely lively, as is Fleur. I am sure they have many years of playing together ahead. Eny, as he is now called, left minus his family jewels, but somehow I don’t think this will calm him down; in fact it may just make him lighter on his feet! I did point out several times that he is not a cat, by the way, but as we all know, the heart goes where the heart goes. And the feeling was clearly mutual, when Damien arrived Eny jumped into his lap and despite much excited, wriggling, that is where he wanted to stay. In other SPA news, one of everyone’s favourites found a home today. Libellule (aka Dragonfly) flew off. This dog just has that magic something, a femininity and grace that is hard to describe, but is so appealing. Her new owner visited the SPA yesterday and rushed back today after a night’s reflection. All of you who like long eared dogs will be thrilled, as are we all. 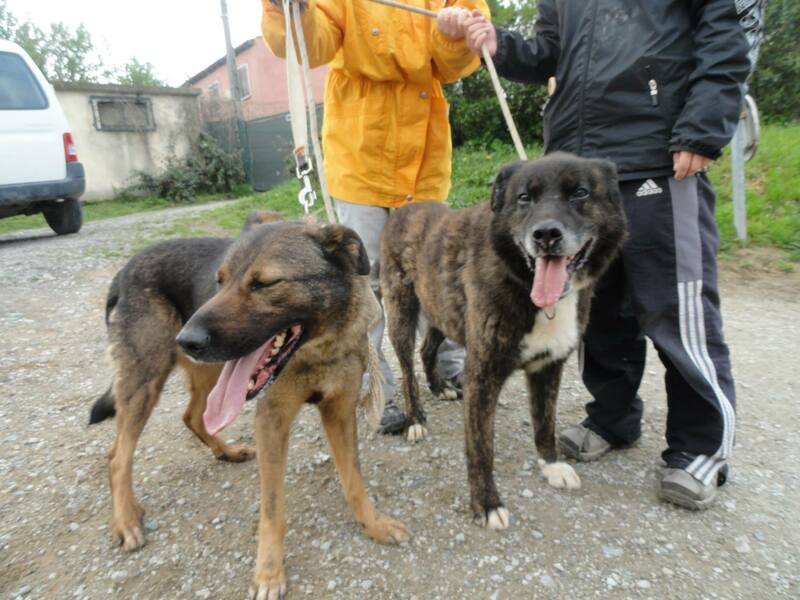 So two lucky dogs have homes tonight, and we had no arrivals. Pet Insurance, A Luxury or Necessity? 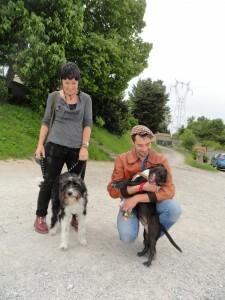 A few weeks ago we received an email from someone who adopted one of our dogs about a year ago. 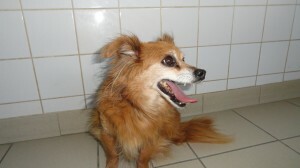 The dog had just had an operation which cost 800 euros , luckily they had pet insurance and asked us to blog about the subject. This is certainly a very controversial subject; some of us have it whilst most of us don’t. So is pet insurance worth it? Should you pay a monthly instalment for peace of mind, put an amount away per month ‘just in case’ or worse, do nothing and have no plan in place. Many pet owners want to know why they should invest in a plan to cover their family pet. Wouldn’t it be easier to stash those monthly payments in a savings account, just in case a major medical event should arise? While putting money aside is always a good plan, it does not always provide the extended financial cushion that the right insurance program can offer. But of course there are lots of insurance companies with lots of plans! One of the main complaints is that routine checks and vaccinations are not covered by pet insurance. Well of course they aren’t! We all have car insurance and tyres and oil changes etc aren’t covered and if they were to be we can imagine the premiums. With pet insurance the scenarios aren’t so different. Take a young Labrador, playing in the snow with a friend, a slip, a yelp, a ruptured cruciate ligament, operation and follow up therapies costs thousands. Should your pet develop a chronic illness or heaven forbid cancer, diagnosis and treatment will very costly, very costly but these costs would be covered by pet insurance. Should you not have insurance you really need to consider what your options would be? Can you afford to pay on-going costs for the rest of the pet’s life? So the main advantage of pet insurance is that you do not have to worry about not being able to afford a vet’s bill. The disadvantages are the cost; it may increase with the age of the pet and the fact that not all illness are covered by all policies. Shop around and read the small print! 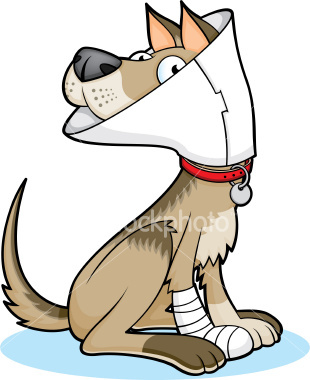 Pet Insurance is without doubt a risk assessment, or, to be blunt, a gamble. You might be lucky and have a healthy pet that only has to visit the vet for routine treatments. In that event you might regret having forked out all those insurance payments. But, if you and your pet are less fortunate and you are confronted with vets’ bills for major operations, you’ll be really glad that you did take out insurance. For me, the peace of mind is well worth the monthly payment. What do you think?